I was working behind our house the other day, while heavy equipment was doing major construction next door. At one point I thought, "Wow, it sounds like they're right in my front yard!" When I finished what I was doing, I went around to investigate the racket that continued in front of the house. There was my "faithful sidekick," Daisy "the wonder-dog." She was doing her best to capture one of the pesky little chipmunks that burrow in our yard. Unfortunately, she was doing it in my flower bed. My plants were trampled as only an excited dog on a mission can do; they were even dug up in the spots where she'd become extra-zealous. Then the drainpipe caught my eye. . .
Evidently, the chipmunk thought this would be a good escape route and scampered up it to get to the roof. Daisy, however, was on a mission and would not be easily dissuaded. The "construction" noise was actually the sound of "destruction" as the drainpipe banged against the house. Daisy obviously put great effort into her work, because by the time I got there she was on her hind legs, reaching up as high as she could. 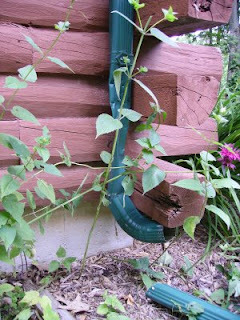 The drainpipe was flatened, twisted, and full of holes where she'd tried to take a bite out of the little critter. I'm sure the chipmunk had a great show looking down from the safety of his rooftop vantage point. Daisy had good intentions. She probably thought she was being helpful, attempting to relieve us of one of those pesky chipmunks. Unfortunately, the result wasn't so good: a torn up flower bed, a crumpled drain pipe and a dirty dog. This made me wonder, "How often do my efforts look like this to God?" I always serve Him with the best of intentions, but if I plow ahead with my plans rather than ask God what He would like me to do, how often do I leave a mess rather than anything of value? Father, forgive me for the times I've rushed off to do things for you without consulting you first. Help me to always seek you before I act so that I can be productive for you. So true , Lisa, definitely words to live by!! "The road is paved with good intentions." has always been one of my favorite quotes. I like your spin on it. I always thought of it as... if I have good intentions of doing something, whether it is improving a skill, helping a neighbor, whatever it is... and I don't do it, the results are disappointment and lost opportunities to serve, improve my skills, and deny blessings to those around me and myself. "Good intentions" are much like" Faith." Without doing the work... it is dead! There are opportunities around us every day to something good! If we see it... just do it! LOL, I love this story because I had a dog that would do stuff like that. I miss him so much. Thank you for sharing this story. Your message spoke straight to my heart. I'm starting to realize how much time and stress I could save myself if I would be more prayerful about the projects I undergo. Instead of barreling forward with my ideas, I'm hoping to pause and listen to His plan for my life. It's kind of like that old expression, "Work smarter, not harder." Except for me it would be, "Pray harder before you start, daughter." We had to fence our small garden spot to keep our dogs from helping in the garden. I loved your sweet helper trying her best to protect you, at least I am sure that is what she though she was doing. Yes may we always walk softly and discover what God actually wants us to do before we rush in where angels fear to trod. Thank you for sharing with us here at Tell me a Story. Beautiful story of instinctive 'good intentions'. Seems to be a theme this season. Girlfriend - you got it! YES! I am learning these same things! I'm going to share this on the SDG FB page right now for #OperationRest.